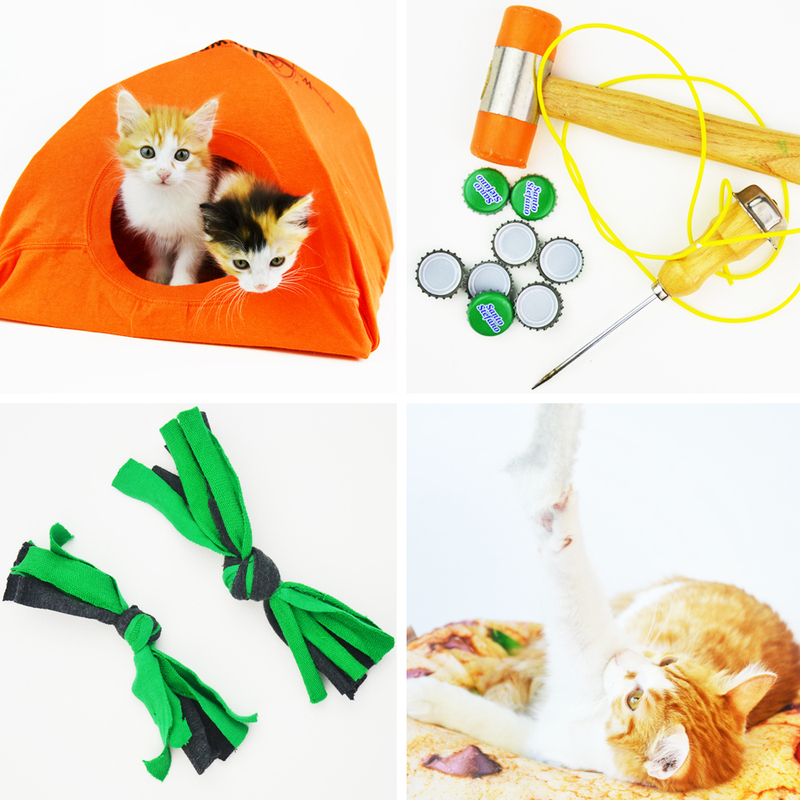 Home Tutorials (all) Craft Tutorials DIY Printable Travel Game Book for hours of fun! It’s summer, which means that there’s a lot of family travel which, in turn, means that there are a lot of bored kids on long trips. When my children are bored silly on plane or train rides, or waiting for adults to do something adult-ish, or if we’re all waiting for food to be served, I try to keep them entertained by playing little games with pen and paper. And so this year I decided to create a printable travel game book with various games all ready for them to play when they don’t know what else to do! 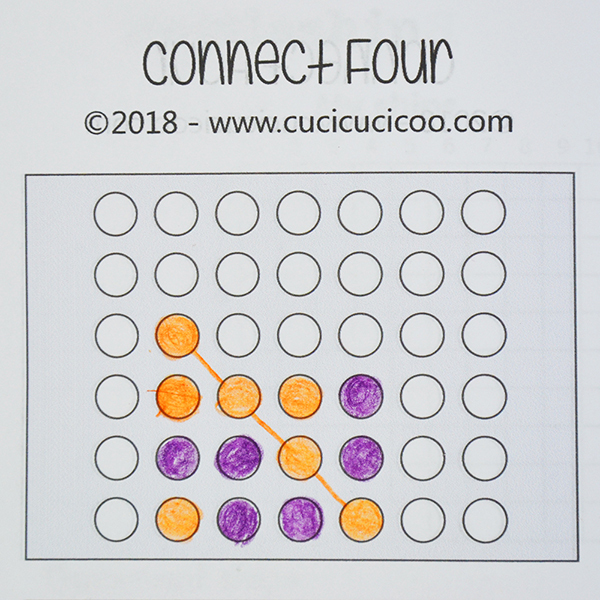 I created printable versions of four games (Connect Four, Dots & Lines, Hangman, and Tic-tac-toe) and asked my friend Elisabetta from the Italian crafty blog ABC Hobby if she could make an English version of her Battleship printable game for my readers to use. 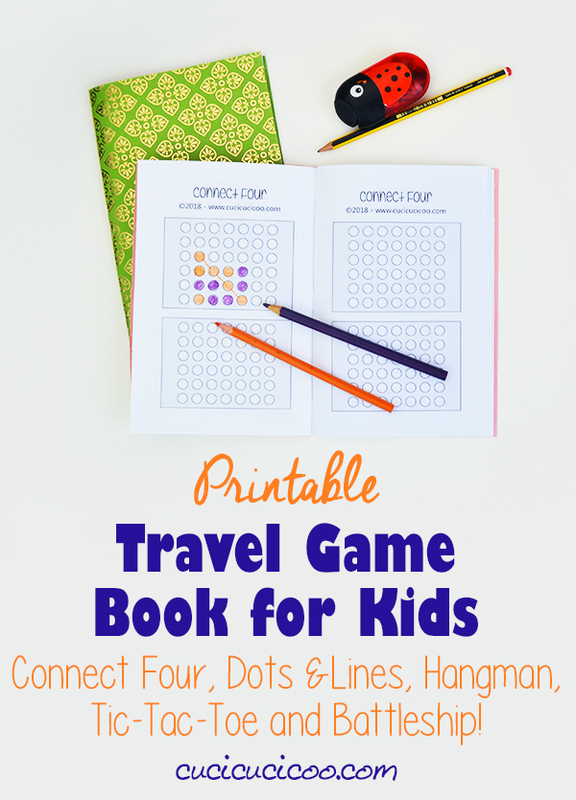 You can create your own printable travel game book with a mixture of all five games, like I did, or choose one or two of your children’s favorite games to fill up a booklet. We recently travelled to Paris and thank goodness that my kids brought their travel game books, because they used them a LOT! 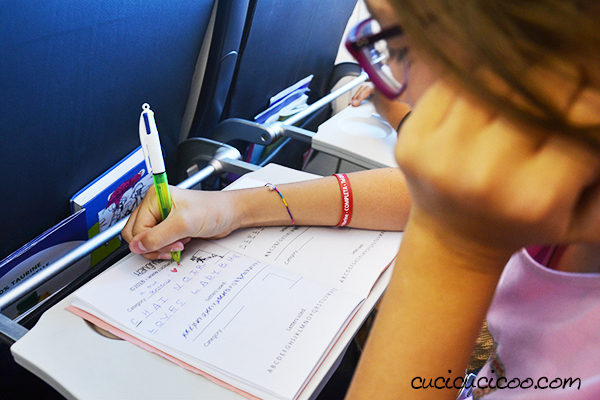 Here you can see a game of Hangman that Sofia and I played on the plane. 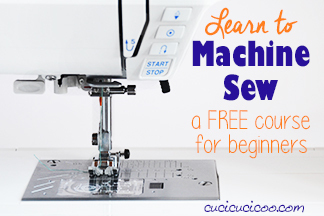 These booklets are so fast to make. 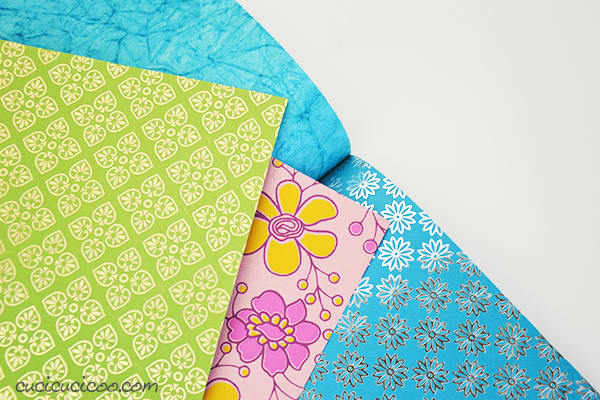 All you need to do is print the pages and staple them into a pretty paper cover with a special trick I use for making books (which you might remember in my DIY blank books made from leftover notebook pages). They’re so fast that I’m making a whole bunch of them to give away to the children of friends and family that we’ll visit later this summer! 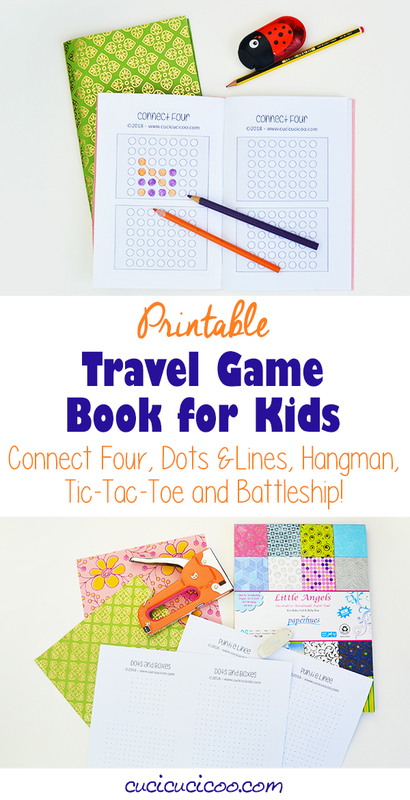 Enough talk… let me show you how to make your own printable travel game book with your choice of five games! Stapler. 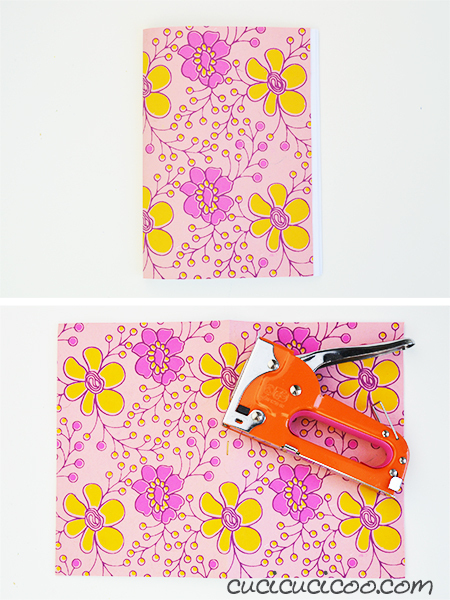 It must be a long arm stapler*, one with a base that folds back to tack to bulletin boards (I’ve been using the same Swingline stapler* for decades), or a staple gun*, which I used here. 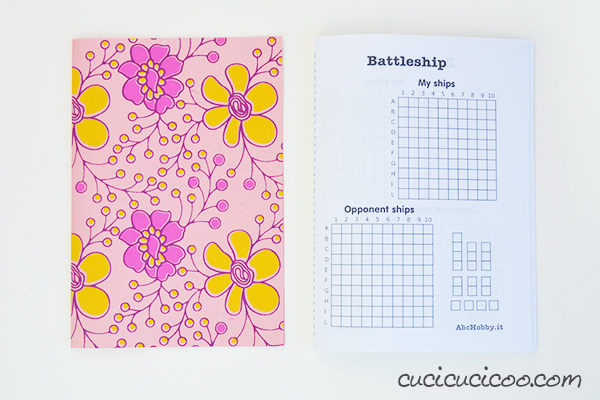 You can download Battleship from ABC Hobby. 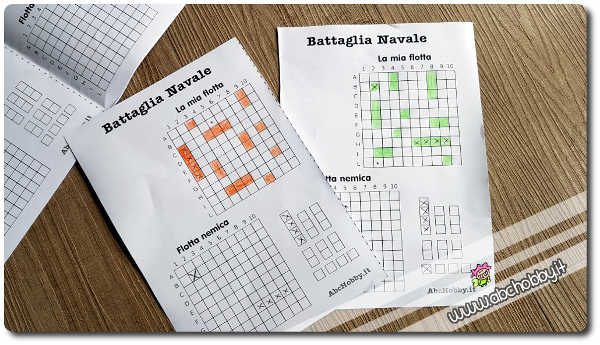 Her blog is in Italian, but she very kindly created an English language version of Battleship for my English language readers. (Thank you, Eli!!) You can read (or translate) her post about the game here, or download the PDF file directly here. 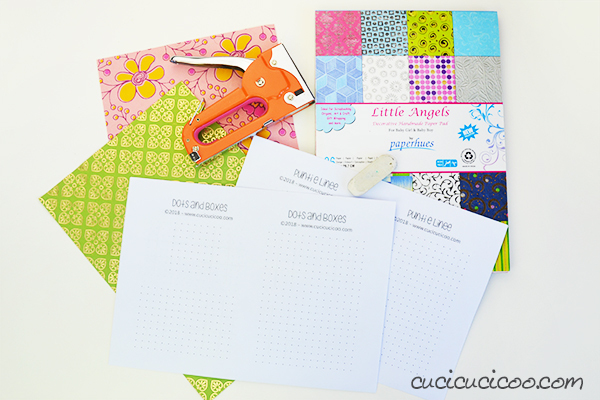 Here are a few sheets from the package of Paperhues “Little Angels” paper*. The real problem with this paper is that each sheet is more beautiful than the next, so it’s hard to choose which one to use! Print the pages of the games that you want on both sides of the printer paper. I printed each game page on two sheets of paper, front and back, for a total of 10 sheets of paper, which is a good amount for these books, but you can decide how many you want to include. 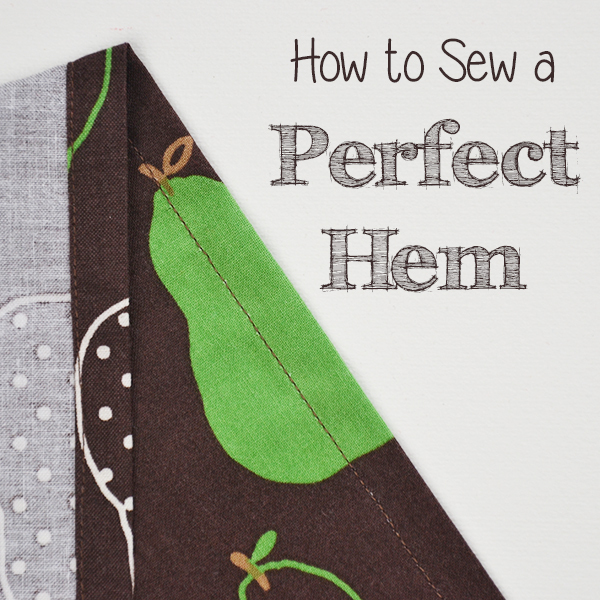 The one important thing to do is, when printing, to set the file to print out fit to the size of the sheet of paper (top arrow), which is the exactly opposite of what you do when printing sewing patterns, and to set the view to landscape, not portrait (bottom arrow). 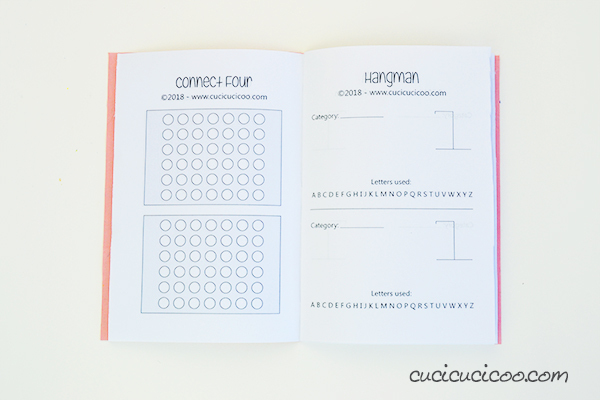 Now that you have all your materials ready, it’ll just take a moment to assemble your printable travel game book! 1. Put all the printed game pages together and fold them in half. 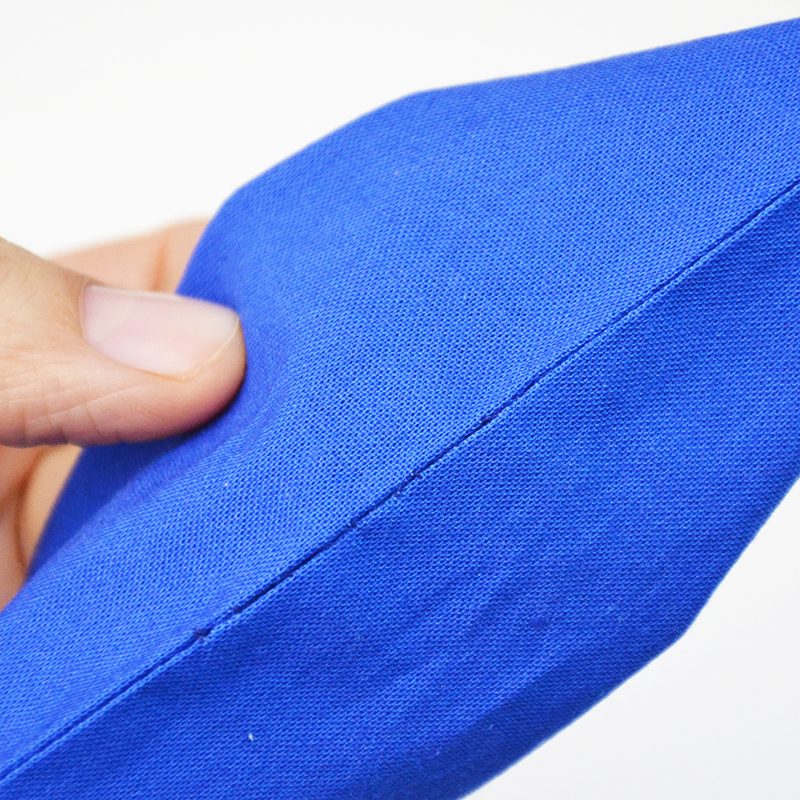 Fold the cover in half, too. 2. Put the folded game pages inside the cover. If the edges of the printed pages stick out beyond the cover (as seen on top), trim them with scissors or a paper cutter. 4. Pull the eraser out from the staple and repeat step 3 two more times along the fold, but close to each edge. 5. 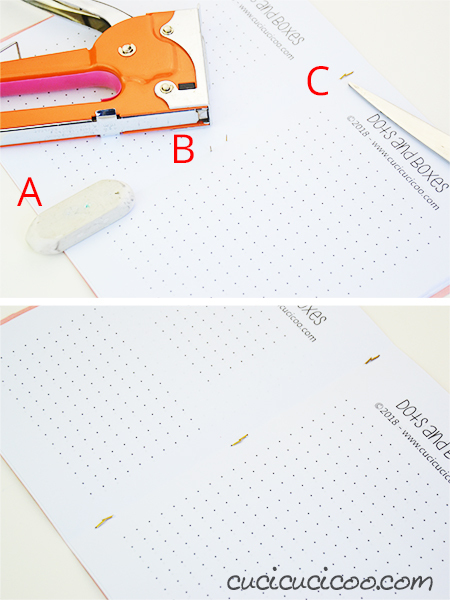 Flip the book over and remove the eraser from the third staple (A above) so that the tips of the staple are sticking up (B above). Then use your scissors to bend over the tips of the staple (C above). 6. Repeat with the other two staples so that they are all bent over. Now that you have a cool printable travel game book, I’ll bet you want to know more about playing the games, huh? Here are some quick instructions. Tic-tac-toe, aka noughts and crosses, is pretty simple and I don’t think I really need to explain it. Two players take turns putting Xs or Os into the grid and try to get three in a row (horizontally, vertically or diagonally), while trying to block the opponent. I love playing Hangman. I used to play it with my friends while in boring assemblies in school, I play it when waiting at the doctor with my kids, and I play it with my EFL students in class. One player chooses a word or phrase and draws out the spaces for the letters. He also has to write down the category. (Not everyone does it that way, but I do.) 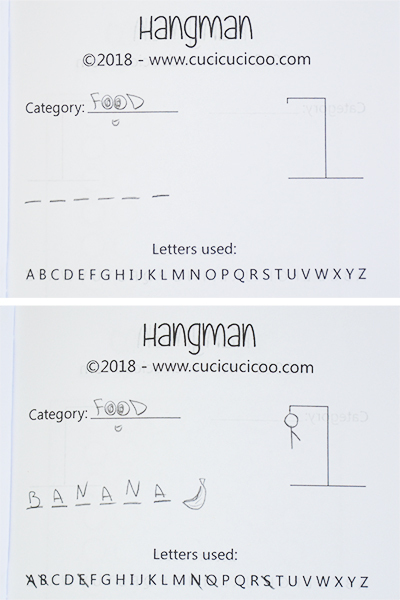 As the other player chooses letters, they get crossed off from the alphabet below and are either inserted into the empty spaces or a part of the hung man gets added. If the man becomes whole (head, body, two legs and two arms), the guessing player loses that round. Most people know Connect Four as a vertical game with slots at the top. You drop different colored pieces in from the top and they fall to the bottom, or on top of the piece that’s highest in that column. 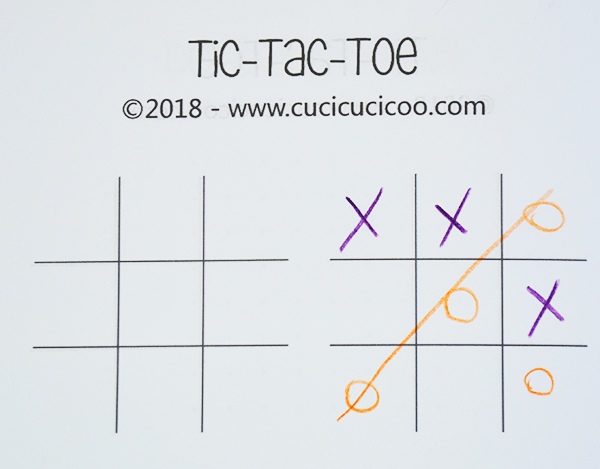 It is similar to Tic-Tac-Toe in that you want to get four in a row (horizontally, vertically, diagonally) while blocking the other player, however you have to remember that you can only work from the bottom up. 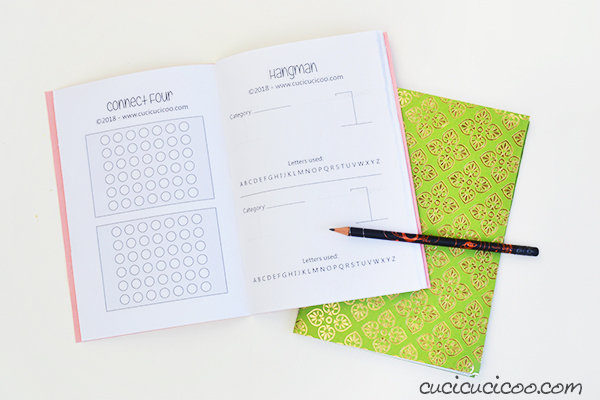 Dots and Boxes is the reason why I came up with the idea of making a printable travel game book in the first place. My mother used to play this game with me when we’d go camping, and I always loved it. I taught it to my kids and I play it with them when we have a lengthy wait, such as in a restaurant. It’s good because you can play with more than two players. The only thing is that I was sick of always having to make up the grid of dots each time, which is why I decided to make a printable grid for this game. I actually don’t remember ever having seen this game anywhere else and never knew what to call it, but a quick Google search showed me that it is a pretty well known game called Dots and Boxes. I created three sizes of grids to use, depending on how much time (and desire) you have to play. In a nutshell, you take turns connecting the dots with vertical or horizontal lines (see 1 and 2 above). I like to use two different colors because it looks cooler that way, but it’s not actually necessary. The goal is to make boxes without letting your opponent make them. The first part of the game with just be filling up the grid with a bunch of random lines, making sure not to put the third “wall” on a box, which would leave it open to the other player to complete. But once you get to a certain point, this gets difficult or impossible. In 3 above, you can see that Orange left a space with just one wall left. In 4, Purple closes that box and puts her initial in it (L for Lisa!). 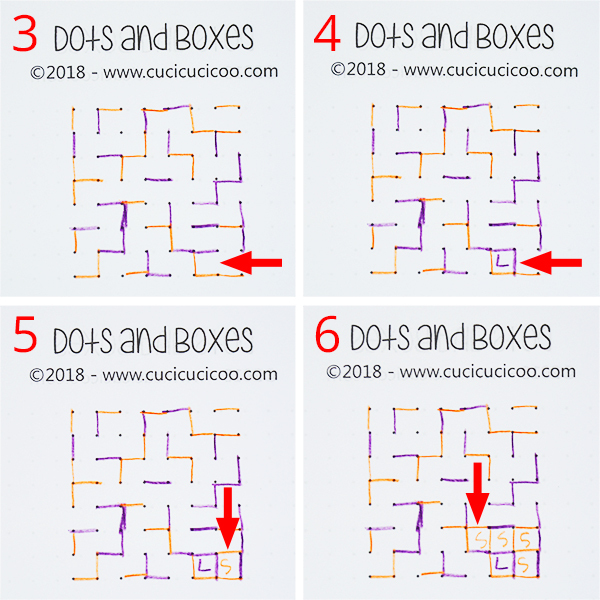 When a player closes a box, she has to go again, and in this case Purple had no choice but to leave another box ready to close for Orange. In 5, Orange closes it and puts her initial. But luckily for her, a tunnel was created in which she could close up a bunch of boxes one after another, as shown in 6. Continue like this until you’ve completed all the boxes. The player with the most completed boxes wins. And once again, Orange (aka, Sofia) beat Purple (aka, me)! She was thrilled because usually I win this game. I didn’t take pictures of how to play this game because it’s already shown (in Italian) here on ABC Hobby. To play this, both players need to have his/her own book, or you need to rip out a page from the book for the other player. The series of square in the bottom right are the ships each player has to position in the top grid, without any of them touching, even diagonally. Players take turns calling out positions by letter and number (“B4!”) and the other has to respond “Hit!” if he has something in that square or “Miss!” if that square is empty. The player who called the square marks it in the bottom grid. I actually mark the squares differently than shown above, with circles for hits and Xs for misses, and once I sink a ship, I put Xs in all the square around the sunken ship. The first player to sink all his opponent’s ships wins. 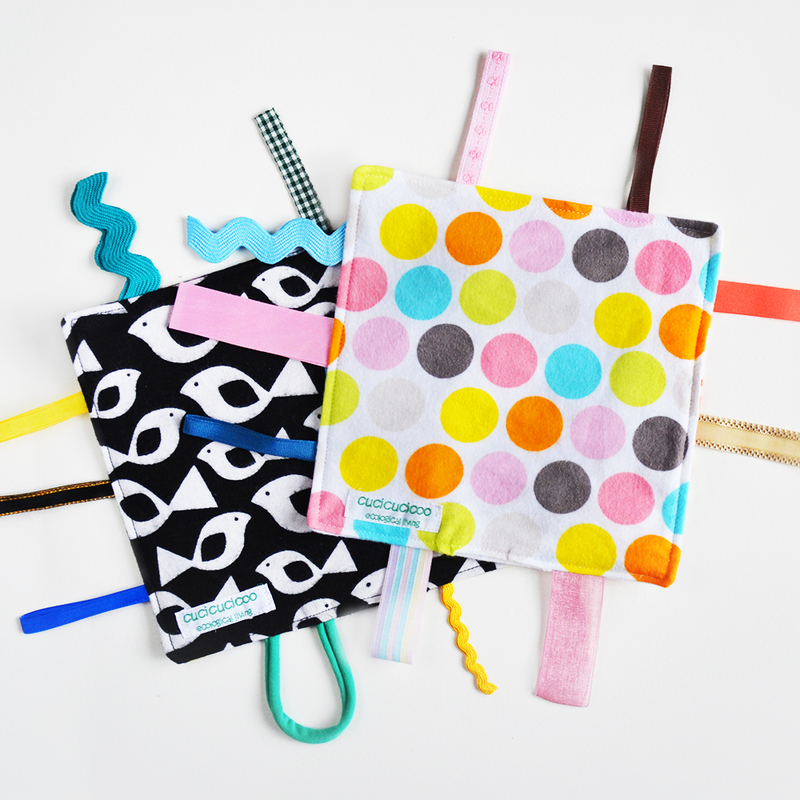 So, now that you have a printable travel game book to keep your kiddos occupied during boring moments this summer holiday, why not prepare some other good creative playthings to keep them off of their cell phones and Nintendos? 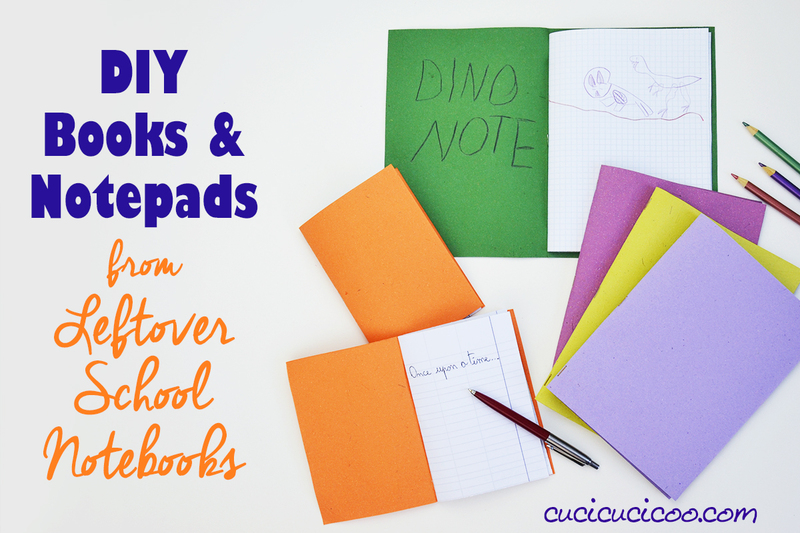 These DIY blank books and notepads are made in a similar way to these game books, and you make them with all the pages leftover from the kids’ school notebooks! It always drives me nuts when they have a bunch of half-used notebooks, and you can be darn sure that I NEVER throw that paper away! Haha! 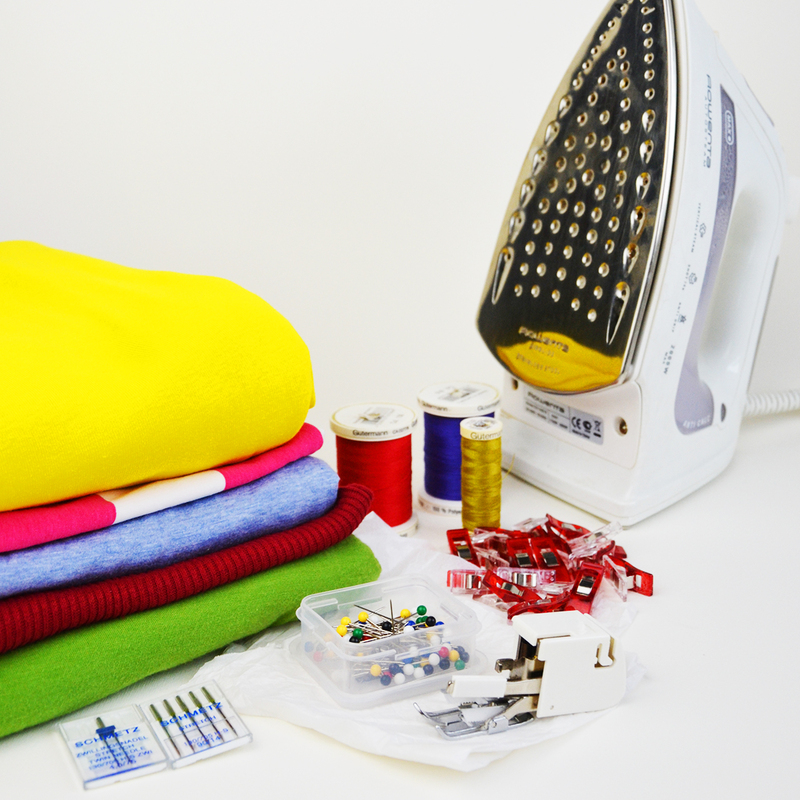 Don’t forget to Pin this tutorial, because you know that it’ll be a lifesaver if you ever hang around kids much! 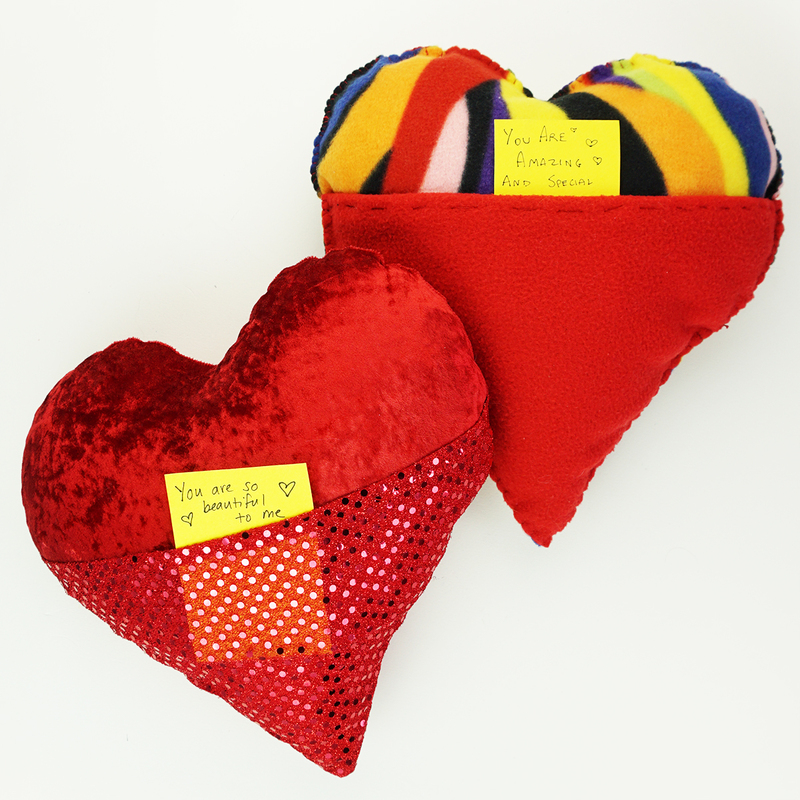 And remember, it’s also a great and easy DIY gift to give to your friends’ or family’s children! Silvia, try it with your kids! 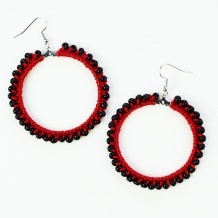 It’s really simple, but really fun too. You can work out simple strategies of where you leave the fewest possible boxes to close up. I love that game! E grazie a te, Elisabetta, per averci “prestato” la tua fantastica battaglia navale! Piace tantissimo ai miei figli! This is such a great idea, Lisa. 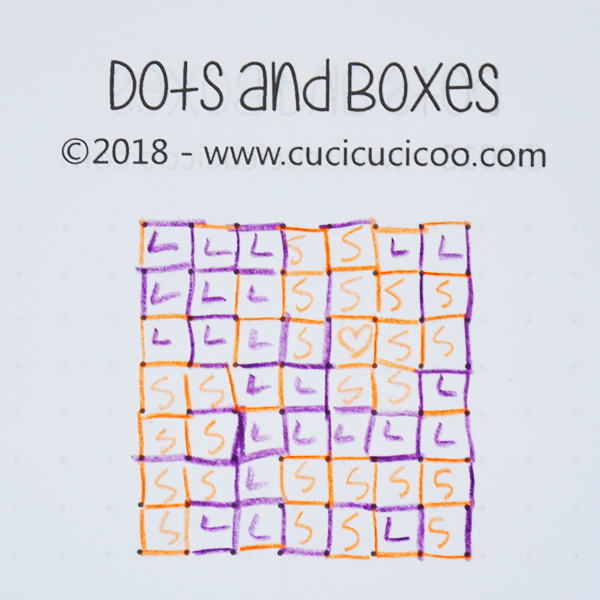 Dots and Boxes is our current favourite. Thanks Pam! So you already knew Dots and Boxes, then. Nobody I’ve talked to had ever heard of it, but that’s my favorite, too! wow, che bella idea!! Sai che il gioco “punti e linee” non lo conoscevo? 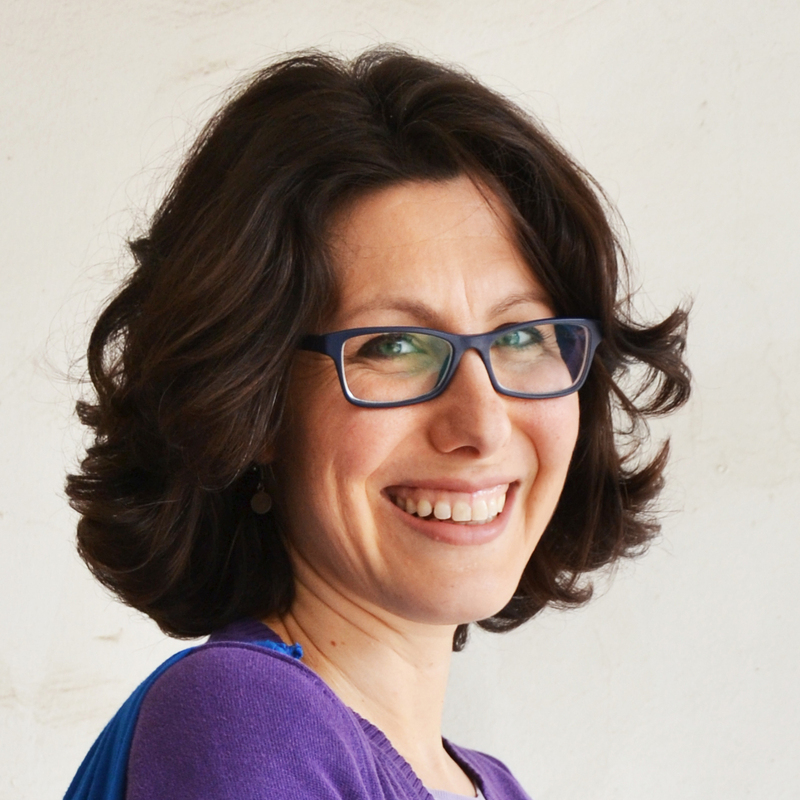 Io ne conosco uno simile, detto il “Diamante”, si fanno punti a caso sul foglio e si collegano cercando di formare dei triangoli impedendo, se possibile, all’avversario di chiudere tre linee, alla fine può sembrare un diamante sfaccettato. Interessantissimo, Paty! “Diamante” sembra molto simile a “Punti e linee”, ma con un incrocio di un altro gioco che facevo spesso con i miei figli quando erano più piccoli, di mettere coppie di numeri o lettere a caso su un foglio e di fare a turni a collegarli in ordine numerico/alfabetico con una linea, ma non si possono incrociare le linee, quindi spesso si arriva a fare aggrovigli impossibili. Ci devo provare! Grazie! 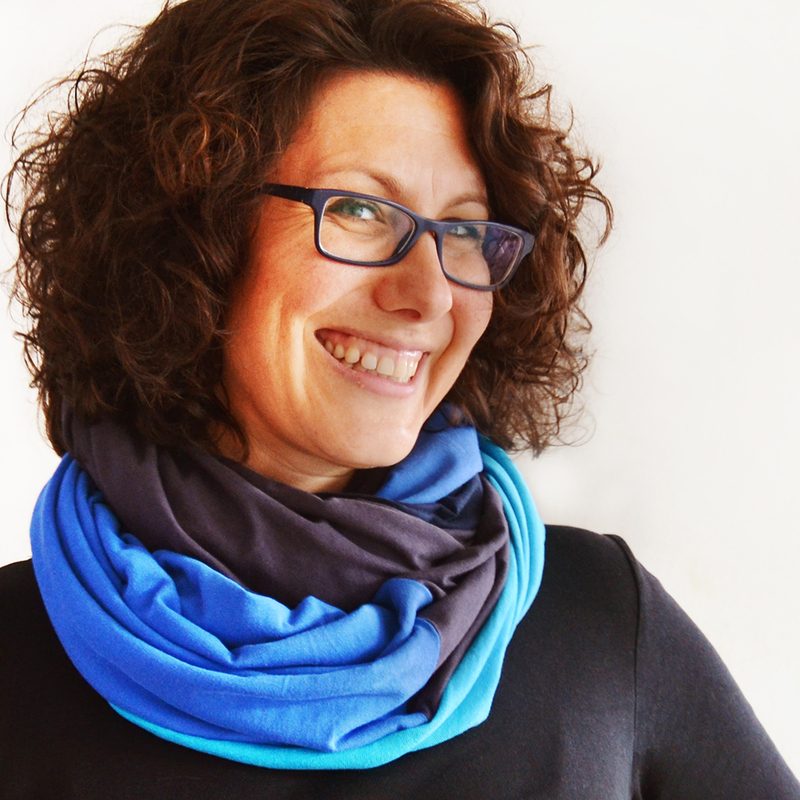 Ottima idea Lisa,altro che il cellulare della mamma! Ho visto in giro per internet qualcuno che mette i fogli con i giochi dentro le fascette di plastica,quelle da inserire nei raccoglitori,e poi compila con i pennarelli per lavagna a secco…così basta passare un panno umido e si può riutilizzare! Si in effetti potrebbero essere anche plastificati a caldo e riutilizzabili! 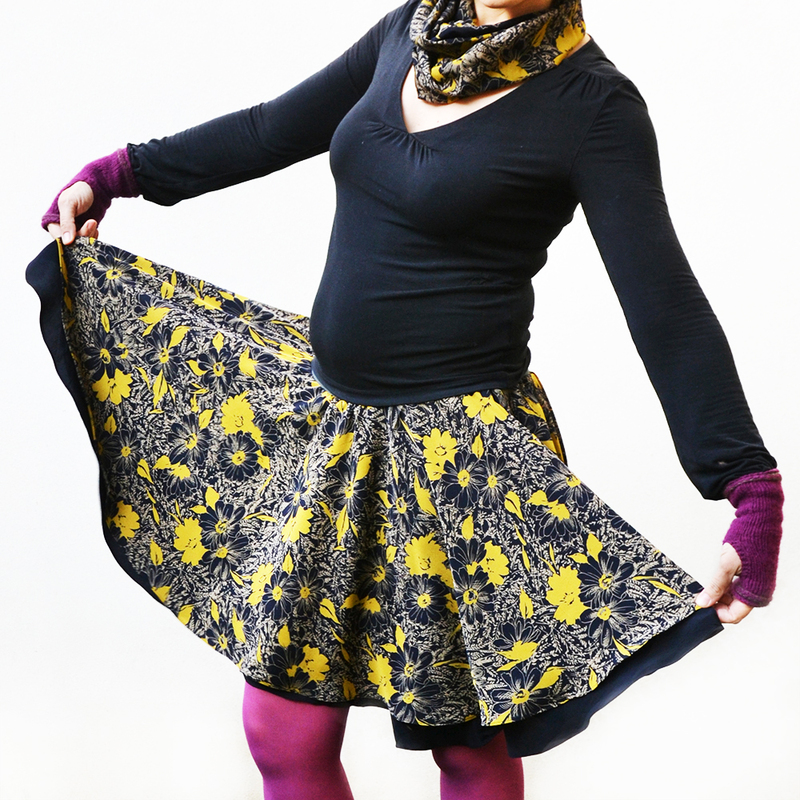 Grazie anche per questo post! Non vedo l’ora che arrivi la sparapunti! Love the book and all those old fashioned games! !